Don't you hate it when your credit card is declined just because you traveled out of state or shopped at a different store? Nowadays, if you buy something out of character, that sets off fraud alarms at the bank and locks down your credit card. MasterCard (MA), recognizing that this is a huge annoyance to customers, has spent "several million of dollars" to rework its vast, worldwide communication network and cut down the false alarms by 25%. It's tapping into all the extra information that's collected on us -- by retailers and your smartphone -- to track our location and verify it's really you. That means you won't have to call your bank and divulge your travel plans. 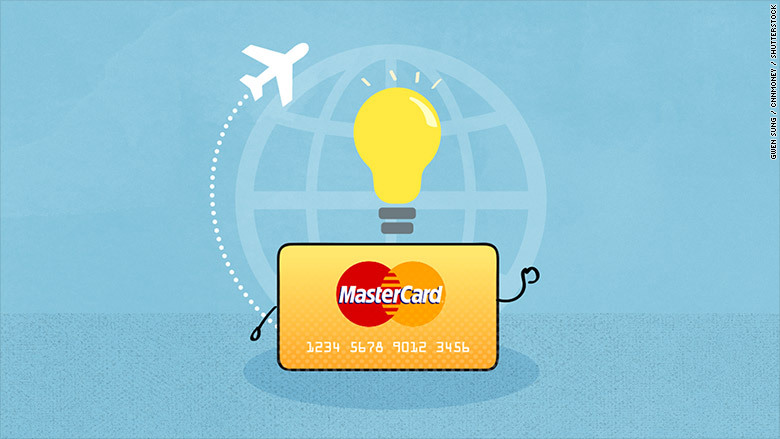 MasterCard will automatically know you're traveling and tell the bank it's OK.
"We believe this is revolutionary," Ajay Bhalla, president of enterprise security solutions at MasterCard, told CNNMoney in an exclusive interview. "Now the card-issuing bank will have all these new pieces of information they never got before to make an intelligent decision." In the next few months, expect your favorite shopping website and the bank app on your smartphone to ask for your permission to track you for better security. This is what they're talking about. It's called MasterCard IQ. The credit card company has cut deals with 3,000 retail stores, who have agreed to pass along coded customer information so that MasterCard can more accurately judge each transaction. MasterCard has also teamed up with a telecom company to track traveling cell phones. Banks have tightened their controls to combat fraud, but they've pushed so far that they lose more money on false alarms than actual theft. In 2014 alone, $9 billion was lost to fraud, according to industry research by Javelin Strategy. But the overzealous security measures cost 13 times as much: $118 billion was "incorrectly declined." That's bad for business. The study showed that customers are less likely to use cards that are declined or even shop at the store or website where a purchase was denied. "It's a massive problem," said Cherian Abraham, a payments expert at the data-tracking giant Experian (EXPGF). "It affects good customers 10 times more than bad ones." Starting now, major online retailers and airlines will send MasterCard a "grading scale for reliability" that's ranked from 1 to 5. The more typical your behavior, the more likely it's you. So, even if you're travel abroad for the first time, your transaction will go through as long as you're using the same laptop. Smaller merchants have been given a special MasterCard algorithm that turns your IP address, device ID and browser information into code, then sends that along to MasterCard. The credit card company will then give your bank a similar "reliability score." MasterCard will be able to tell that you're using the same iPhone as usual. But the data can't be reverse engineered to identify individual users, MasterCard said. "This took us a very, very long time to develop," Bhalla said. "We want to add intelligence, but we don't want to get any personally identifiable information." MasterCard IQ will also work for traveling shoppers. If you're traveling in the United States, your phone's Wi-Fi will tell your bank app your location, so MasterCard knows you're in a particular city. For that, it partnered up with mobile tech company Zumigo. If you're traveling internationally, your phone will send out a signal when you arrive in a particular country. MasterCard partnered with Syniverse, which tracks phones when the start roaming abroad.